Royal - 10 year old, Poney Francais de Selle (Titan du Mougard x Hirondelle d'Orval), 145cm. Awesome pony jumper! Fast, careful, brave with a hugely adjustable stride! No issues with the combinations set on horse strides. Experienced at 1.20m. Placed 3rd at the Cedar Run 6-bar, going clean at 1.40m. Royal had a clean sweep of three first place finishes to be the 2014 All Canadian Pony Jumper Champion at the Royal Winter Fair in Toronto. Also won the $5000 Pony Jumper Stake at the RAWF 2015. 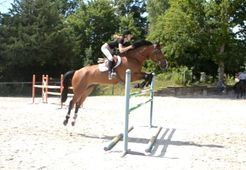 Standing du Pas - 9 year old, 17.3hh, SF gelding. Suitable for all three rings. Solid record with a Junior rider. High five figures. As decoeur Tardonne - 6 year old Selle Francaise gelding, Caldero x Lux Z. The perfect package for an ambitious amateur. Low to Mid five figures. Running Bear - 12 year old Half Welsh gelding (Bearly Light x Butterscotch), 14.2hh (permanent card). 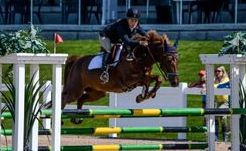 Experienced in the short stirrup, beginner/modified hunters and jumps a 1.20m course. Excellent teacher. Hack winning trot and textbook jump. At BDF Equestrian you are purchasing directly from the owner. We proudly offer for sale our home bred and developed ponies and show jumpers. 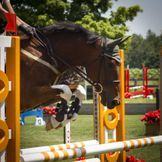 We also carefully select and import European ponies and show jumpers that we consider essential for developing our own elite young riders who aspire to national and international competition. These horses are also for sale and come with complete histories, including the original breeder. Most horses have current sets of digital x-rays and pre-purchase exams which will be made available for your consideration.